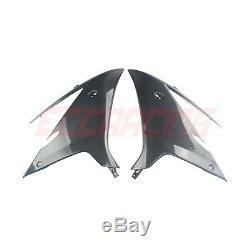 TRIUMPH DAYTONA 675R 2013 2014 15 TWILL Carbon Fiber UPPER SIDE FAIRINGS. High quality TWILL WEAVE carbon fiber surface, fiberglass backing; Epoxy resin for high strength; UV protective clear coat with GLOSSY finishing, no fading; Most of our parts are predrilled, replace the original but will not come with. Hardware/mounting kit/mounting brackets/screws, please use original hardware/mounting kit/mounting brackets/screws. The item "TRIUMPH DAYTONA 675R 2013 2014 15 TWILL Carbon Fiber UPPER SIDE FAIRINGS" is in sale since Wednesday, May 9, 2018. This item is in the category "eBay Motors\Parts & Accessories\Motorcycle Parts\Body & Frame\Fairings & Body Work".